For father's day, give dear old dad a bbq rub—and make him a steak! 1. Whisk together the brown sugar, paprika, black pepper, salt, chili powder, garlic powder, onion powder, and cayenne pepper in a bowl. 2. Spoon it in a jar with a lid. 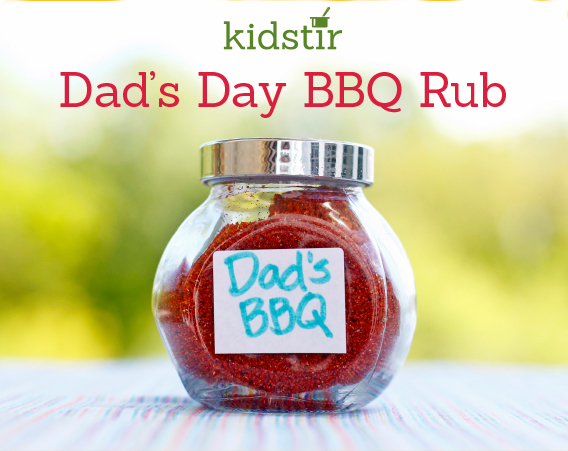 Add a sticker label that says "Dad's BBQ Rub." 3. To use the rub, place the steak on a dinner plate. Spoon on the spice mix and rub it into the meat with the back side of the spoon. Repeat on the other side. 4. A grown-up can help grill the steak. First, heat the grill, then grill the steak for about 5 minutes on each side, or until cooked to your liking.